Prior to Moto G5 Plus, all Moto G phones used micro SIM card. This means if you just upgraded from other Moto G or Moto E phones, your old SIM card cannot be used directly in Moto G5 Plus. You need to get a new nano-SIM card from your carrier for Moto G5 Plus. 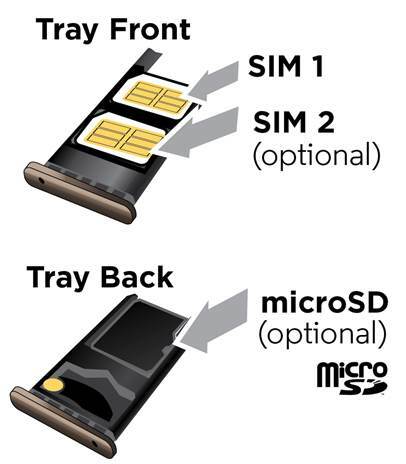 In many regions, carriers now offer 3-in-1 SIM card, which can be used as mini-SIM, micro SIM and nano SIM. You can get a nano SIM card by breaking the smallest part from the 3-in-1 SIM card. If your old phone is using a micro SIM card , you can check whether it is a 3-in-1 SIM card (check whether some parts are detachable). You should always get an official nano SIM card from your carrier for Moto G5 Plus. Do not trim nano SIM card from micro SIM card by yourself. The official nano SIM card is 0.67 mm in thickness and micro SIM card is 0.76mm. There are some popular phones using nano SIM card including: Galaxy S8 and S8+, Galaxy S7, Galaxy S7 edge, Galaxy Note 7, Galaxy S6, Galaxy S6 edge, Galaxy S6 edge+, Galaxy Note 5, iPhone 7, iPhone 7+, iPhone 6S, iPhone 6S+, iPhone 6, iPhone 6+, iPhone 5, Moto X (including all generations),Moto Z and many more. If you are using any of these phones, you can use existing SIM card for Moto G5 Plus. Unlike Samsung or LG, Motorola uses a different SM card tray in Moto G5 Plus. Moto G5 Plus SIM card tray has two sides. The upper side (when Moto G5 Plus screen is facing downwards) is for SIM cards. The lower side is for micro SD card. For dual SIM versions of Moto G5 Plus, two SIM card slots can be found in the upper side. For single SIM version of Moto G5 Plus, there is only one SIM card slot. You cannot convert single SIM version of Moto G5 plus to dual SIM version by changing the SIM card tray. The firmware are different! You can follow these steps to insert or remove SIM card in Moto G5 Plus. You should power off Moto G5 Plus when you want to add, remove or change SIM card for Moto G5 Plus. On the top of Moto G5 Plus, insert the SIM tool into the tray hole as shown below, press it a bit. The Moto G5 Plus SIM card tray should pop out. You can then pull it out slowly. Moto G5 SIM card tray has two sides. The upper side (when Moto G5 Plus screen is facing downwards) is for nano SIM card. There are two versions of Moto G5 Plus. In US and a few regions, Moto G5 Plus can only use one SIM card. You will then find one SIM card slot as shown below. In most international markets, Moto G5 Plus supports two SIM cards. So, in these regions, Moto G5 Plus is dual standby dual SIM phone. It is possible to make both SIM cards available at all times (even when you are engaged in a call in one SIM card) for dual standby phones. You may follow this guide to make both SIM cards always available and will not miss any calls. For the dual SIM version of Moto G5 Plus, you can find two SIM card slots as shown below. You can put one or two SIM cards. You need to follow the etched shape with metal part facing outwards (upwards). Nono SIM card should fit the slot perfectly. Make sure the clipped corner align with the slot. The backside of the tray is for SD card. Do NOT insert SIM card into micro SD card slot. You may damage the phone. Now, insert the Moto G5 Plus SIM card tray into the phone. You may press it slightly once it is fully in the phone. Now, you can power on the phone and use the phone. Can I use one SIM card in dual SIM version of Moto G5 Plus? Yes, you can just use one SIM card in dual SIM version of Moto G5 Plus. The second SIM card is optional. The SIM card slot does not matter. You can put SIM card into either slot. I have a single SIM version of Moto G5 Plus, can I make it dual SIM version by buying a SIM card tray for dual SIM version of Moto G5 Plus? The firmware in single SIM version of Moto G5 Plus does not support two SIM cards at all. So, don’t waste time and money for this. How to make both SIM cards available at all times and not to miss any calls in Moto G5 and Moto G5 Plus? Although Moto G5 and Moto G5 Plus are dual standby only, you can make both SIM cards available at all times by settings up call forwarding and call waiting. If you set them properly, you will not miss any calls even when you care engaged in a call. If you want to get this feature, you can follow how to make two SIM cards always available in dual SIM dual standby Android phones. Do you know the correct size of Moto G5 Plus SIM card? Do you know how to insert or change SIM card in Moto G5 Plus now? If you have questions or encounter any problems on Moto G5 Plus SIM card, please let us know them in the comment box below. I have had my moto 5g plus for over a year now but just received a message saying “invalid SIM card”. Any ideas what went wrong and what I should do now? Thanks. No SIM card, or invalid SIM card? If it says invalid SIM card, it usually means the SIM card cannot be registered on any carrier networks. You can try to reboot the phone to see whether it helps. If not, you may call yours carrier to check whether the SIM card is deactivated. If you messed up mobile network settings, you can try to reset phone settings. If it says no SIM card, then, it means the SIM card was not detected. You can power off the phone, reinsert the SIM card. I am switching from a motog4 phone to a motog5 plus phone. The g4 SIM card is to big to put into the g5 slot. How do I transfer my contacts, texts, photos, and documents to my new phone? Very few items are saved in the SIM card. Most of the data you mentioned are saved in the phone. For contacts, you can sync with your Google account so that you can access them from any devices. Photos can be automatically backed up to Google Photos. You can access them from any other devices. For messages, call logs and contacts, you can use some third apps to backup and restore them. You can search Google play store for SMS backup and restore. You should choose apps with a rating higher than 4.2 and more than 100000 installations. There are quite a few. Hi, My G5S SIM tray will take a SIM card and an SD memory card. How do I make it take two SIM cards. . It depends where you got the phone. If it’s a single SIM version, you cannot use two SIM cards. What are you taking about? Can you turn on the phone? What do you mean” activate “? I am in the USA and have the g5 PLUS with dual SIM capability. I just read this guide and it seems that I will be unable to use 2 SIM cards at the same time. Is this still an accurate statement? I bought a MOTO G5 plus 3 months ago from best buy. Is there anyway for me to find out if it is unlocked? I will be traveling abroad soon. Do you mean carrier locked? If it’s carrier locked, the staff in Best Buy should tell you and you can only use sim card from the specific carrier. Most Moto G5 plus phones are unlocked. Depending on the region where you are going to travel, you need make sure whether local network is GSM (like AT&T’s network) or CDMA (like Verizon’s). I’m having the same problem as Dave that commented on October 23rd. Sprint sims cards do not work. I even went to Best Buy and bought a SIM card for a note 7 because your web site says different phone cards work. It doesn’t. Looks like I’ll have to send my phone back if sprint SIM cards do not work. I was repeatedly told that SIM cards are made for specific phones now. For Sprint, you may ask them to activate the phone. Sprint and Verizon have more control on which device you are allowed to use. I bought a new Moto G5 Plus (unlocked) from Best Buy on Oct 14, 2017 and can’t find a Sprint SIM Card for it. I went to 5 Sprint stores, 2 Best Buy’s made many calls and on one can find one… All I need is a Sprint SIM Card and my carrier (iWereless) will activate it… Waste of time and money so far. Not sure what you are talking about. SIM card is always issued by the carrier. When you subscribe to their services, they will issue one for you. 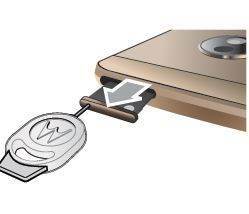 Motorola cannot give you a SIM card. The phone doesn’t include a SIM card, only a SIM card tray for you to put SIM card which you should get from the mobile company who charges you for the usage. I’m having the same problem. No sprint sims work. I was told cards are made for specific phones. Even bought a note 7 sim because the website says it can be used. Nope. Doesn’t work. Waste of money. Might have to send the phone back to Amazon. You need to activate the phone in any Sprint service center. The problem is not on the sim card. Both Sprint and Verizon may ask you to activate the phone. But Verizon loosened the requirement. Anyway, if you are using unlocked phones, stay away from Sprint. if the sim card tray is damaged, you have to get a new one. Normally, if the phone is sold locally, the service center should have spare parts. anyway, you can try your luck in ebay. Occasionally, such items can be found there.